Can't seem to find that original, special purim surprise to share with your loved ones this Purim? Looking for the perfect gluten free mishloach manot to send to all your gluten free friends and acquaintances? Why not send them a Gluten Free Palace Purim gift box? We have great mishloach manot ideas! Our beautifully presented happy purim basket is bursting with treats that can be enjoyed without worry. This lovingly handcrafted turquoise green cardboard gift box is adorned with a gorgeous festively designed ribbon. Send this lovingly presented and personalised kosher cookies to your friends, kids or relatives and really let him or her know that you appreciate them! All of our kosher cookie gift boxes contain individually wrapped, shelf stable, delicious gluten free purim cookie and treats! As a finishing touch to your thoughtful purim gifts kids box, a sweet message can be inscribed on a personalized note! Our mishloach manot boxes contain a delightful assortment of gluten free hamantashen purim cookies in raspberry and/or apricot flavor! Send a gourmet gluten free kosher mishloach manot this holiday, and warm the hearts of your family and friends! Send kosher gluten free cookies today! Please note: This item’s packaging will indicate what is inside and cannot be hidden. HANDCRAFTED MISHLOACH MANOT GIFT BOX; KOSHER GIFT BASKET (ALL ITEMS CERTIFIED BY OU) - The Gluten Free Palace cookies gift box is the perfect treat to gift someone with this Purim holiday. Handcrafted orange cardboard gluten free gifts boxes filled with gourmet gluten free cookies! Customize your kosher purim baskets with a personalized message that can be inscribed on a lovely gift note! DELICIOUS GOURMET JEWISH GIFT BASKET, PERFECT COOKIE BOXES FOR GIFT GIVING; INCLUDES CERTIFIED KOSHER, WHEAT-FREE, DAIRY-FREE, GLUTEN-FREE COOKIES- Our gourmet cookie gift baskets include: a delightful assortment of mouth-watering gluten free hamantashen in raspberry and/or apricot flavor! All treats inside are individually wrapped and certified Kosher. Share our gluten free purim basket with someone special this holiday. INDIVIDUALLY WRAPPED AND SHELF STABLE GLUTEN FREE FOOD GIFTS, AFFORDABLE & LUXURY PURIM PACKAGES, SAY 'HAPPY PURIM!' WITH OUR GOURMET GIFT BASKETS KOSHER - Our purim gift baskets are stuffed with goodies, wrapped in a ribbon and held in a beautiful orange handmade cardboard box. The recipient will be full of joy at the care and attention to detail of their gift. Our luxury jewish gifts also work wonderfully as a kids purim basket; there is something inside for everyone! 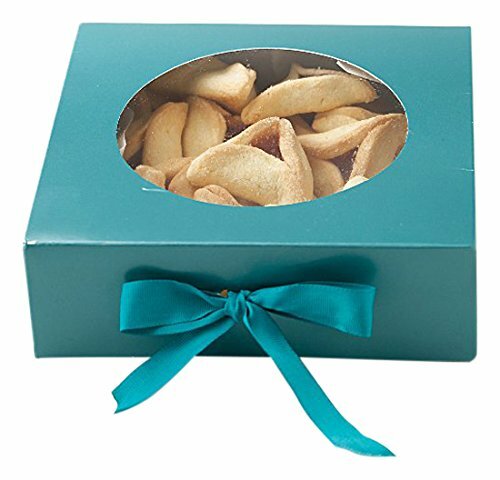 SPREAD THE HOLIDAY JOY WITH GLUTEN FREE PALACE CUTE PURIM BASKETS; CUSTOMIZED GLUTEN FREE PURIM TREATS FOR THAT SPECIAL SOMEONE - Our hand-made gourmet gift set makes a wonderful surprise holiday treat for both kids and adults alike. This exciting Purim collection of sweet treats is sure to please food connoisseurs with fine taste. A Gluten Free Palace gluten free gift basket is the perfect gift to say "Happy Purim" this holiday! Affordable and thoughtful gift basket gluten free - make someone's day this year! UPSCALE PURIM FOOD GIFTS, OUR PURIM BOXES INCLUDE A PERSONALIZED NOTE: JUST ENTER GIFT NOTE IN THE COMMENTS SECTION WHEN PLACING YOUR ORDER - As a finishing touch to your purim gifts box, a sweet message can be inscribed on a personalized note. The perfect purim gifts for kids- our cookies are 100% gluten, wheat and dairy free. Because being kosher and gluten-free shouldn't limit delicious gift giving this holiday! If you have any questions about this product by Gluten Free Palace, contact us by completing and submitting the form below. If you are looking for a specif part number, please include it with your message.